Eclipse Mosquitto is an open source (EPL/EDL licensed) message broker that implements the MQTT protocol versions 3.1 and 3.1.1. It is one of the most famous MQTT broker. Its very easy to install and easy to use. It is lightweight and is suitable for use on all devices from low power single board computers to full servers. The MQTT protocol provides a lightweight method of carrying out messaging using a publish/subscribe model. This makes it suitable for Internet of Things messaging such as with low power sensors or mobile devices such as phones, embedded computers or microcontrollers. The Mosquitto project also provides a C library for implementing MQTT clients, and the very popular mosquitto_pub and mosquitto_sub command line MQTT clients. Its can be installed on Unix machines. It can be secured via SSL and passwords, which we will describe below. Mosquitto is part of the Eclipse Foundation and is an iot.eclipse.org project. Mosquitto is highly portable and available for a wide range of platforms. Go to the dedicated download page to find the source or binaries for your platform. Log into the AWS Ubuntu Instance. Install both the mosquitto broker and the publish / subscribe clients. $ mosquitto_pub -h localhost -t mychanel "Hello World"
To publish or subscribe using this broker from a remote machine, we need first open port 1883 in the security group setting. Using the AWS console, go to the security group and open port 1883 to everyone. Everytime you edit the conf file, you will have to restart the service for the settings to take effect. If MQTT broker crashed sometimes, disabling the real time communication. So we added a script that checked the state of the process and restarted Mosquitto in case it was down. This can script can be saved in a file say ‘mosquitto_restart.sh’. This file needs to be made an executable and then put in a cron job that runs every 5 minutes. The cron should be set as root. Close cron tab. Now the script will execute every 5 minutes and restart mosquitto in case it is in active. We used letsencrypt certificates to secure our MQTT server. letsencrypt available free. The commands to install letencrypt certbot are as follows. The next step is to complete the HTTP challenge. To do that you need to assign a domain/subdomain e.g. mqtt.example.com to this IP address. You should also open the HTTP port 80 in the security group. The subdomain e.g. mqtt.example.com should already be added as record in DNS settings with your domain name provider. The above command run the HTTP challenge on its own. The option -standalone-supported-challenges http-01 specifies that it use the HTTP port 80 only, -d specifies the subdomain. You will be prompted to fill in your email address and agree to terms and conditions. Add the above line to the cron tab. The post-hook statement will restart the broker if the certificates have been renewed. 45 4 * * * certbot renew --noninteractive --post-hook "systemctl restart mosquitto"
Open up port 8083 in the security group for this instance, and restart the MQTT broker. You can now access the MQTT service on port 8083 using secure web sockets (WSS). I strongly recommend for Adding password protection to the MQTT. Close the configuration file and restart the broker. You now need the specified user name and password to subscribe or publish on the MQTT broker. $ mosquitto_sub -h localhost -t test -u "user" -P "password"
$ mosquitto_pub -h localhost -t "test" -m "hello world" -u "user" -P "password"
A complete configuration file is given below for reference. It uses password protection, runs a MQTT on port 1883, MQTTS on port 1884, websockets on port 3033, and WSS on port 8083. Do not forget the open these ports in the security group. Install the latest Mosquitto distribution. Password file will contain your username and the encrypted password. Run the following command to create and add a user to this file. Then, you will be asked for your password twice, enter that too. “allow_anonymous false” is used to prevent, clients without username and password to connecting to the broker. 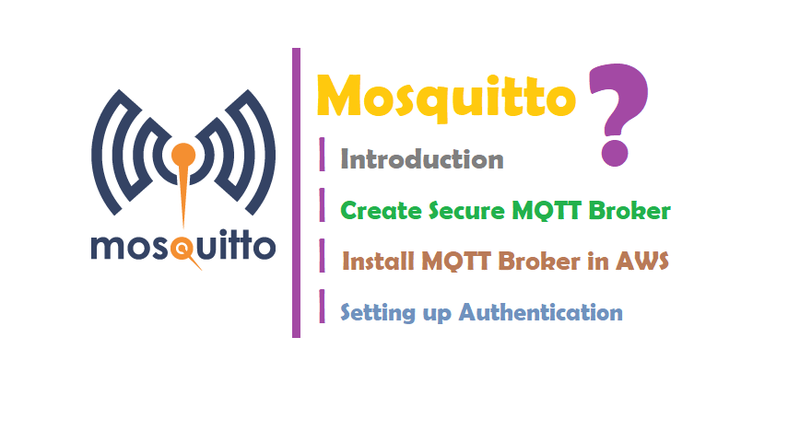 I hope you like this article “Mosquitto MQTT broker.” if have you any Query, Please write in comment box.